SHAH ALAM: The Immigration Department raided Section 24's Uptown, here, two days ago following complaints that the place was being frequented by illegal immigrants at night. Apart from hanging out there as customers, some were also employed to work at several premises in the area. 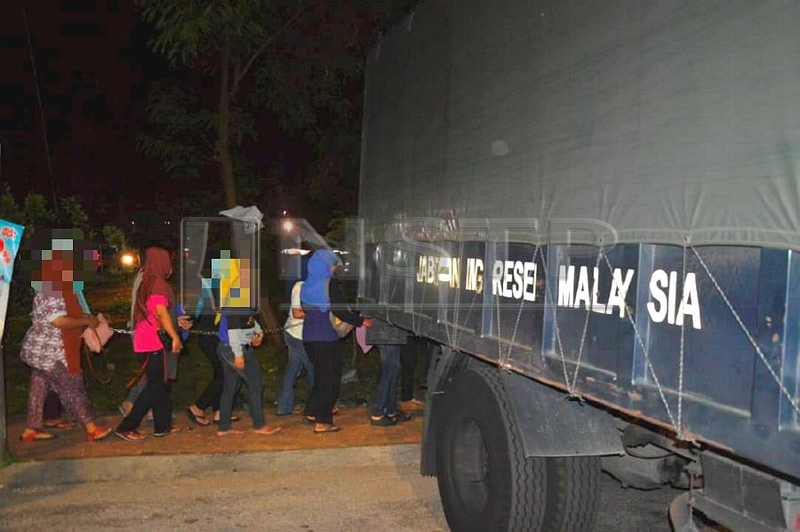 Acting on complaints, a team of 44 officers and personnel from the Selangor Immigration Department and the state's National Registration Department (NRD) raided the location at 11.30pm. Dubbed Ops Kutip, the operation lasted until 2am with 67 illegal immigrants detained for further action. State immigration director Mohamad Shukri Nawi said some of the complaints were obtained from Netizens through social media. "We conducted checks on 120 illegal immigrants and found that 67, including women, committed Immigration-related offences," he said. "Those detained were between the ages of 20 and 55 and they were taken to the the state Immigration Department's enforcement division for further action," he said in a statement, here. According to Mohamad Shukri, during the raid, several illegal immigrants tried to run away or hide after realising the presence of enforcement officers. "Their attempts failed because our officers were ready and we made early preparations," he said. The case, Mohamad Shukri informed, was being investigated under Section 6(1)(c) of the Immigration Act 1959/63 for not having a valid pass/permit and Section 15(1)(c) of the same Act for overstaying.